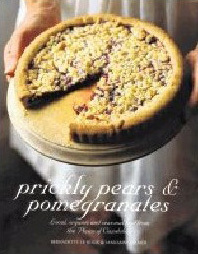 Prickly Pears & Pomegranates By Bernadette le Roux and Marianne Palmer Publisher: Quivertree Publications (Also published in Afrikaans as Marmelade & Moerkoffie). R330. Compiled and written by the daughter-in-law and granddaughter of Eve Palmer, author of The Plains of Camdeboo, this 220-page hardcover demonstrates that the Karoo, far from being the simple, barren wasteland so often depicted, can be a crusty bread basket, an exotic fruit bowl and a butchery filled with delectable meats. Prickly Pears and Pomegranates is more than a cookery book; it is a culinary experience in its own right, punctuated with sensible advice, farm tales and family stories, and offset with 100-year-old pictures of early Palmers, travelling the world outside the Karoo for inspiration. Craig Fraser’s scene- conjuring photos of the shrubs, herbs, gardens and landscapes that have shaped these recipes bring to life the freshness of the ideas and the inspired flavours. How about Lamb and Lemon Soup? Or Guineafowl Gougere? Or Rum-Battered Figs soaked in Rooibos? The first Palmer wife was Fanny, who upset her first dinner guests on the farm near Graaff-Reinet by flattering them with crystal, fine china and fancy European food. All they had wanted was a bowl of pumpkin and samp. She adapted, given time and the benefits of travel, and subsequent Palmer wives have introduced additional German, Scottish and Mediterranean inspirations. The addition of Marianne’s experimental nature combined with her Afrikaner background results in the greatest imaginable hotpot of flavours. The family’s story is intriguingly woven into the recipes and there is love in every platter of food. Each dish is photographed and presented in a style anyone could emulate. This book, SA’s winner of a 2008 Gourmand World Cookbook Award in the best local cuisine category, is now in the running for ‘Best in the World’, which will be awarded in May. It is an absolute joy for cooks, Karoo aficionados and country-lovers alike, offering countless recipes for bringing the Karoo into your own home.